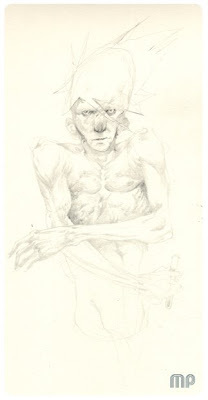 M. Puncekar Illustration: Sketch-a-day 047 and Assassins. The last things of the week. Besides sketch-a-days. Feels good. Was super productive today, barring an arby's attack. Saw that three roast beef and cheddar sandwiches for 5 bucks, and nabbed some curly fries too. Really, really, really regretted scarfing all that down for dinner. So I spent a few hours laying in bed cursing processed cheddar and shaved roast beef. But more importantly, what do we have here?! First thing is a Styles and Concepts assignment. A 3 color max, assignment. Had to be on a play/musical, or be a menu cover for a restaurant. 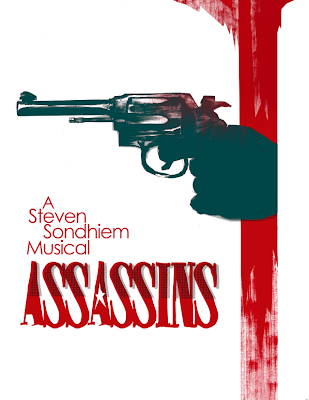 Dug up "Assassins" while looking for a play. The closet thing I've ever seen to a musical are some Sweeny Todd clips online. Managed to simplify my rough big time, and eliminate a whole color. Like it a lot more than I ever thought I would. Especially for the miniscule amount of time it took. Text probably took the longest (went through some variations). Second thing is my sketch for today. Scanned funny. After about 7 years of servitude from my canon scanner it's starting to scan a bit funny. Well enough, though. Be using it more now that I know the greatness that is photomerge. Which will hopefully rule out me using my camera for anything artwise. It's never the same unless it's scanned. To be fair here, it is drawn with a 4h tech pencil and an HB for the dark highlights. I hate you. Your stuff is SO good.